Get instant Access to The Titan Resell Rights Business at the discounted Price of just $247 $197 $47 ONE OFF payment for LIFETIME resell rights! Because I'm finally giving a few people resell rights to Video Titan! I'm talking about the chance to get a product that is on course to sell over $100,000 of units on JVZoo! Sure, the Titan copy/marketing was awesome, but the main reason this converted is the product. 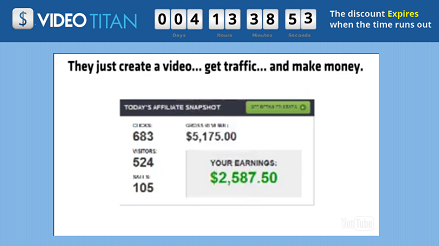 Included in Titan are 6 software tools, which completely change for the game for affiliates everywhere. Copyright © thevideotitan.com. All Rights Reserved.